Ganges in Hinduism, is about the river Ganges, which is considered sacred and is personified as a goddess known as Ganga. Decent of the Ganges River. The vast expanse of the Ganges as it enters the Bay of Bengal near Calcutta. Mention is made of Ganga in Rig Veda. Krishna identifies himself as Ganga in Gita....Shankaracharya considers Ganga as the chief of all Gods and Goddesses and is the ‘redeemer of the fallen’. Vivekananda carried the river water to the West with the faith that whenever in trouble a drop or two of Ganga water would soon be calm again. Those who bathe at Ganga at least once in its pure water are protected from thousands of dangers forever and get rid of sins of generations and are purified immediately. The Lord is so kind that He has spread the river Ganges throughout the universe so that by taking bath in that holy river everyone can get released from the reactions of sins, which occur at every step. And again, Subhuti, suppose a woman or a man were to renounce all their belongings as many times as there are grains of sand in the river Ganges; and suppose that someone else, after taking from this discourse on dharma but one stanza of four lines would demonstrate it to others. Then this latter on the strength of that would beget a greater heap of merit, immeasurable and incalculable. There are few things on which Hindu India, diverse as it is, might agree. But of the Ganges, India speaks with one voice. 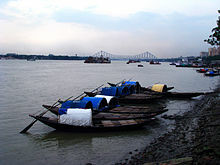 The Ganges carries an immense cultural and religious meaning for Hindus of every region and every sectarian persuasion. My desire to have handful of my ashes thrown into the Ganga at Allahabad has no religious significance so far as I am concerned. I have no religious sentiments in the matter. I have been attached to the Ganga and the Jumna rivers since my childhood. As I have grown older, this attachment has also grown. I have watched their varying moods as the seasons changed, and have been though of the history and myth and tradition and song and story that have become attached to them through long ages and become part of their flowing waters. The Ganga, especially, is the river of India, beloved of her people, round which are intertwined her memories, her hopes and fears, her songs of triumph, her victories and her defeats. She has been a symbol of India's age long culture and civilization, ever changing, ever flowing, and yet ever the same Ganga. She reminds of the snow-covered peaks and deep valleys of the Himalayas, which I have loved so much, and of the rich and vast plains below, where my life and work have been cast. God creates the world as Brahma, sustains it as Vishnu, and destroys it as Shiva. One day, Shiva started to sing. Vishnu was so moved by the melody that he began to melt. Brahma caught the molten Vishnu in a pot. This was poured on earth. it took the form of the river Ganga. The Ganga nourished the earth. to bathe in the Ganga’s waters is to bathe in God. Maha Kumbh Mela at Prayag. Divine potency can also be a function of time. The confluence of the Ganga and the Yamuna is for the Hindus more sacred than any other confluence of any other rivers. Hence more pilgrims bathe at this sangam [confluence]. The flow of pilgrims rises dramatically when the planet Jupiter enters the house of Aries, and the Sun enters the house of Capricorn. The planetary alignment takes place once in twelve years, which is marked by Maha Kumba Mela, the great gathering of holy men, believed to be the largest congregation in the world. Thilaka Ravi:The belief that the Ganges washes away sin entices millions of Hindus into the river each year, and huge crowds of pilgrims are currently passing through the town of Haridwar for the three-month Kumbh Mela bathing festival. Suppose a man becomes pure by chanting God’s holy name, but immediately afterwards commits many sins. He has no strength of mind. He does not take a vow not to repeat his sins. A bath in the Ganges undoubtedly absolves one of all sins; but what does that avail? They say that the sins perch on the trees along the banks of the Ganges. No sooner does the man comes back from the holy waters than the old sins jump on his shoulders from the trees. The same old sins take possession of him again. He is hardly out of the water before they fall upon him. Therefore I say, chant the name of God, and with it pray to Him that you may have love for Him. Pray to God that your attachment to such transitory things as wealth, name, and creature comforts may become less and less every day. In the morning I bathe my intellect in the stupendous and cosmogonal philosophy of the Bhagavad Gita, since whose composition years of the gods have elapsed, and in comparison with which our modern world and its literature seem puny and trivial; and I doubt if that philosophy is not to be referred to a previous state of existence, so remote is its sublimity from our conceptions. I lay down the book and go to my well for water, and lo! there I meet the servant of the Brahmin, priest of Brahma, and Vishnu and Indra, who still sits in his temple on the River Ganga reading the Vedas, or dwells at the root of a tree with his crust and water jug. I meet his servant come to draw water for his master, and our buckets as it were grate together in the same well. The pure Walden water is mingled with the sacred water of the Ganga (Ganges). The Ganges front is the supreme showplace of Banares. Its tall bluffs are solidly caked from water to summit, along a stretch of three miles, with a splendid jumble of massive and picturesque masonry, a bewildering and beautiful confusion of stone platforms, temples, stair flights, rich and stately palaces...soaring stairways, sculptured temples, majestic palaces, softening away into the distances; and there is movement, motion, human life everywhere, and brilliantly costumed - streaming in rainbows up and down the lofty stairways, and massed in metaphorical gardens on the mile of great platforms at the river's edge. Mother [Ganga] you girdle the earth and thereby lend it grace and beauty. You are the pathway, bedecked with banners of victory, to heaven. My only prayer to you is that I may live on your bank, watch your waves, repeat your name in my heart forever and die with my eyes fixed on you. Swami Vivekananda, in “The Ganga A River Of Life”. Swami Vivekananda:The holy sight of Ganga gives knowledge, splendours, name, fame etc. The gravest of sins like Bramhhatya (killing of a Brahmin) and Gauhatya (killing of a cow) get absolved by the mere touch of Ganga holy water. The holy sight of Ganga gives knowledge, splendours, name, fame etc. The gravest of sins like Bramhhatya (killing of a Brahmin) and Gauhatya (killing of a cow) get absolved by the mere touch of Ganga holy water. Vivekananda:Paris is the fountain-head of European civilisation, as Gomukhi is of the Ganga. Vivekananda:See what an atmosphere of holiness is here -- the pure air of the Ganga -- what an assemblage of Sadhus -- will you find anywhere a place like this! See what an atmosphere of holiness is here -- the pure air of the Ganga -- what an assemblage of Sadhus -- will you find anywhere a place like this! The vapour becomes snow, then water, then Ganga; but when it is vapour, there is no Ganga, and when it is water, we think of no vapour in it. The idea of creation or change is inseparably connected with will. So long as we perceive this world in motion, we have to conceive will behind it. One day as this sage, Valmiki, was going to bathe in the holy river Ganga, he saw a pair of doves wheeling round and round, and kissing each other. The sage looked up and was pleased at the sight, but in a second an arrow whisked past him and killed the male dove. As the dove fell down on the ground, the female dove went on whirling round and round the dead body of its companion in grief. In a moment the poet became miserable, and looking round, he saw the hunter. "Thou art a wretch," he cried, "without the smallest mercy! Thy slaying hand would not even stop for love!" "What is this? What am I saying?" the poet thought to himself, "I have never spoken in this sort of way before." And then a voice came: "Be not afraid. This is poetry that is coming out of your mouth. Write the life of Rama in poetic language for the benefit of the world." And that is how the poem first began. The first verse sprang out of pits from the mouth of Valmiki, the first poet. And it was after that, that he wrote the beautiful Ramayana, "The Life of Rama.". There are men who practice Titiksha, and succeed in it. There are men who sleep on the banks of the Ganga in the midsummer sun of India, and in winter float in the waters of the Ganga for a whole day; they do not care. Men sit in the snow of the Himalayas, and do not care to wear any garment. What is heat? What is cold? Let things come and go, what is that to me, I am not the body. With the Holy Mother as the centre of inspiration, a Math is to be established on the eastern bank of the Ganga... On the other side of the Ganga a big plot of land will be acquired, where unmarried girls or Brahmacharini widows will live; devout married women will also be allowed to stay now and then. Men will have no concern with this Math. And as I am, so are you, O Vishnu. And as you are, so am I. And as Uma (Parvati) is, so is the Ganga. The form is not different. And whoever says that there is some difference between Vishnu and Rudra, between Sri and Gauri, or between the Ganga and Gauri is a very foolish person. Even the most hardened atheist of a Hindu will find his heart full of feelings he has never felt before the first time he reaches the bank of the Ganga. Her hymns constantly emphasize the running, flowing, energetic movement of her waters, and they do so at times with elaborate alliteration and onomatopoeia, as in this line from the famous Ganga Lahriri; marullila-lolallahari-lulitambhoja-patala 9May your running waters …”covered with lotuses that rock in your waves and roll playfully in the wind”…weaken the web of my earthly life). According to some accounts, the Ganga split into seven streams as she emerged from the hair of Shiva, three flowing to the east, three to the west, and the Bhagirathi to the south. This tradition recalls the seven rivers of the Vedic hymns and reminds us that the Ganga in essence waters the whole earth. Indeed, when Bhagiratha brought the Ganga to earth, her waters not only restored the ashes of the dead but also replenished the ocean, which had been swallowed by the sage Agastya. She, the Ganga, is my supreme image, having the form of water, the very essence of Shiva’s soul, She is nature (Prakriti) supreme and the basis of countless universe. For the protection of the world, I playfully uphold the Ganga. Who is mother of the world, the supreme Brahman’s embodiment. O Agastya, one should not be amazed at the notion that the Ganga is really Shakti, for is she not the supreme energy of the eternal Shiva, which has taken the form of water? Om, Praise be to the auspicious Ganga, gift of Shiva, O Praise! Praise be to her who is Vishnu embodied, the very image of Brahma, O praise! Praise to her who is the form of Rudra, Shankara, the embodiment of all gods, the embodiment of healing, O praise! Essence of the scriptures and embodied goodness of the gods. to you, giver of sacred rest. to you, up lifter of all . to you, the perfect physician. This Ganga was sent out for salvation of the world of Sambhu, Lord of lords, filled with the sweet wine of compassion. Shankara, having squeezed out the essence of yoga and the Upanishads, created this excellent river because of his mercy for all creatures. As a celestial stream flowing upon the earth she has her mythic origins in the world of the Vedas. As the tradition developed, she wound her way into the myth and ritual of Vaishnavas and Shaivas alike. She is hardly the best known consort of either Vishnu or Shiva, but she has acquired the position of consort to both of them, something no other goddess can claim. Even Brahma keeps close company with her, carrying the river in his water pot. As one of India’s largest and most sacred pilgrimage centers, Benares (Varanasi) has been revered for centuries by Hindus, Muslims, Buddhists, and Jains, millions of whom come to visit its innumerable temples and shrines and come to bathe along a three-mile stretch of steps leading to the Holy Ganga (Ganges) River. Whether coming for salvation, prosperity, or healing, most of these pilgrims have sought some form of ritual purification – a means of unloading their troubles and sins upon stars and holy men, the river Ganga, and the many sacred tanks fed by her springs and tributaries. ...it is more than river. She is the Holy Mother. She is Ganga Ma. The story of Holy Mother’s decent to earth has been recounted in numerous oral traditions, as well as in the Epic and Puranic literature. The story of Holy Mother’s decent to earth has been recounted in numerous oral traditions, as well as in the Epic and Puranic literature. Through the single minded austerities of the pious King Bhagiratha, Lord Brahma granted a boon that Ganga Ma would descend upon the earth so she might carry sixty thousand of his cursed ancestors to the netherworld. Her fall was broken by Shiva’s matted locks, which prevented the earth from being destroyed by her impact, and locks channeled her downward flow from the Himalayas. Once upon the plains, Ganga Ma sought out King Bhagiratha in Banaras, who led her to the remains of his ancestors in Bengal, where she swept them along to the other world. Skanda Purana: ...Banaras is the largest and most visited of these thirthas, presenting itself as Kashi (“the luminous”), an otherworldly abode that rests Shiva’s trident and grants instant liberation to all who die within its boundaries. When Ganga was brought to Haridwar, then all the Gods asked: ’We wash all sins, but who will wash us?’ Ganga said this to Lord Vishnu:’Lord Vishnu Bhagwan, tell us, what should we do?’ Then the Lord said: ‘As many sadhus and saints are living in this world, every time they will bathe in Ganga, all your sins will be washed away [automatically]. One should not be amazed … that this Ganges is really Power, for is she not the Supreme Shakti of the Eternal Shiva, taken in the form of water? Eck describes the creative power of the Ganga as “liquid Shakti”, evidenced by the fertility of fields along her banks and her position as a second consort and active principle of Shiva. The mother keeps the baby in the stomach for nine months and then gives birth. She cleans her excreta and urine, and the child is [always] in this when he is small. Then that is [how] the mother takes care of the baby, doesn’t she? So she is Ganga Ma. All this trash, good things, bad things, everything, is in her. So she will never be impure. The mother is never impure. 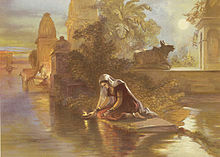 Rajiv Gandhi:he Ganga is the symbol of India's Culture, the source of our legend and poetry, the sustainer of millions. Today it is one of the most polluted rivers. We will restore the pristine purity of the Ganga. A Central Ganga Authority will be set up to implement an action plan to prevent the pollution of the ganga and its tributaries. Pollution in Ganga is like Oil in water. The Ganga is the symbol of India's Culture, the source of our legend and poetry, the sustainer of millions. Today it is one of the most polluted rivers. We will restore the pristine purity of the Ganga. A Central Ganga Authority will be set up to implement an action plan to prevent the pollution of the ganga and its tributaries. A Prayer for the Ganges. Across India, environmentalists battle a tide of troubles to clean up a river revered as the source of life. For India's devout Hindus, the sacred River Ganges is always clean and always pure -- even if its waters are a toxic mix of human sewage, discarded garbage and factory waste. Ganges water is well known for its extraordinary resilience and recuperative capacity. ...the Ganga is most pure… but what is put into it is polluted.